The universe of Corporate Entities engaged in business with the Real Estate and Construction Industry is vast. These are the value adders to the main stream, front end construction and engineering aspects, while operating behind the scenes. Cement, TMT Steel, Concrete, Brick manufacturing, Paints, Chemicals, Hardware & Accessories, Switches & Switchgear, Roofing & Cladding, Wood & Ply, Wooden Flooring, Water technologies, Plumbing and Pipes & fittings, Glass, Glazing & Facades, Elevators & Escalators, are just to name a few. The Real Estate, Infrastructure and construction industries are in a dynamic flux due to continuous changes in Technology and Business Models. Yet, the industry experiences considerable difficulty in benefiting from economies of scale, which is unique when compared to other industries that benefit considerably from economies of scale. Any innovative contribution to this industry, both in technological and business terms makes for indispensable value addition in real time. 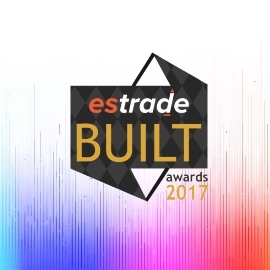 Estrade recognizes & rewards the best in this space. Most innovative performers with proven track record in excellence in Innovation, Business Acumen and Technological lead will be rewarded and be known conspicuously in the current challenging and competitive market.